Is your income under $45,000 for families and $35,000 for individuals? (add $2,500 for each dependent). 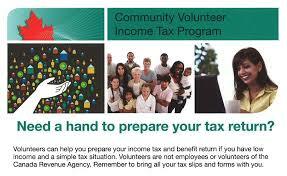 The CRA community volunteer income tax program can help you file your 2018 income tax. Bring your 2017 notice of assessment and your 2018 information slips.